IMPORTANT : these stockings have a lining that makes a rustling noise, the fabric is audible when the stocking is handled... that is why we have placed them on closeout 50% discount. If you purchase them without embroidery, they are returnable but there are no returns on embroidered ones. 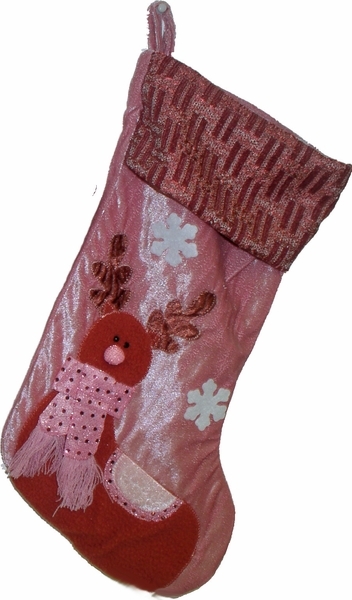 Pink, hot pink, antique pink fleece embellished Christmas stockings with a designer knit cuff. Comes in three designs Santa, Snowman and Reindeer, just choose the complimentary design (if it is not already sold out) from the list of our stockings. Absolutely the most adorable pink design Christmas stockings personalized in metallic silver color thread. If you are a pink fanatic, we can also personalize this stocking with metallic pink thread but please note pink thread on the pinkish stocking cuff does not contrast very well. Also embellished on the stocking are silver and pink bling bling accents making these stockings absolute pink glitz heaven. The stocking is fully-lined with pink satin (yes even the lining is pink) and the stocking measures 19 inches along the diagonal from the top of the cuff to the toe, and is 7 inches wide across the cuff.